Left and right ventricle are the two lower chambers of the heart. The heart is a muscular organ pumps blood throughout the body. The upper chambers of the heart are known as left atrium and right atrium. Left ventricle receives blood from the left atrium and pumps blood to the aorta to the body. Right ventricle receives blood from the right atrium and pumps blood to the pulmonary artery. 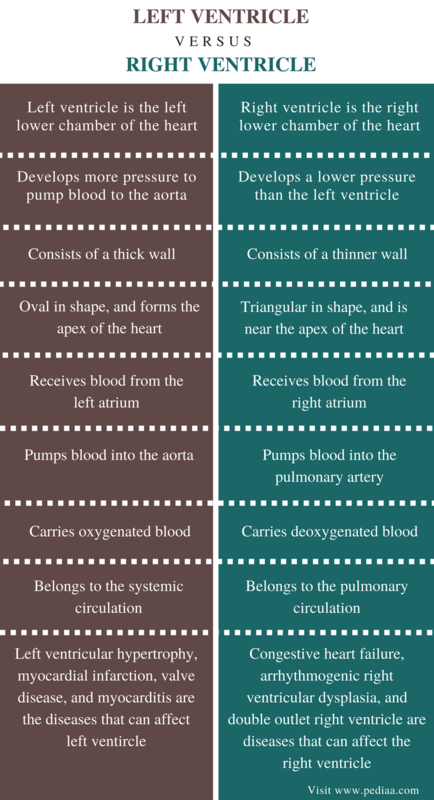 Left ventricle carries oxygenated blood while right ventricle carries deoxygenated blood. The thickness of the wall of the left ventricle is higher than that of the right ventricle. The main difference between left and right ventricle is that left ventricle develops more pressure when pumping blood to the aorta whereas right ventricle develops less pressure compared to the left atrium. Left ventricle is the left lower chamber of the heart, which receives oxygenated blood from the left atrium. Left ventricle pumps blood to the aorta. Left and right ventricles form the apex of the heart. Left ventricle is separated from the left atrium by the mitral valve. 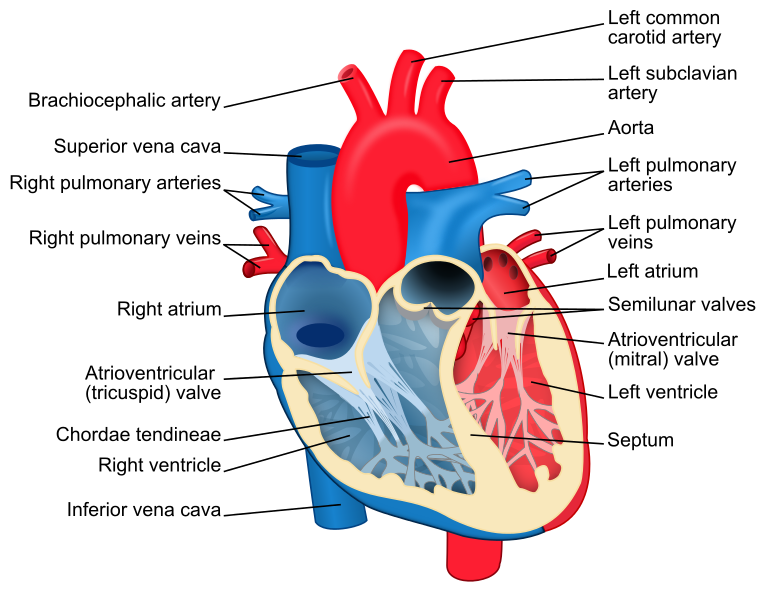 The left ventricle and the aorta is separated by the aorta valve. The aorta supplies oxygenated blood to the rest of the body. The left ventricle consists of the thickest wall of the heart. Hence, it generates the highest pressure upon the blood pumped to the aorta. The anatomy of the heart is shown in figure 1. Various conditions may affect the structure and the function of the left ventricle. The enlargement and hardening of the left ventricle are called the left ventricular hypertrophy. This is caused by uncontrolled high blood pressure. Myocardial infarction, valve disease, and myocarditis are some of the other diseases in the left ventricle. Right ventricle is the right lower chamber of the heart, which receives deoxygenated blood from the right atrium. Righ ventricle supplies blood to the pulmonary artery. The pulmonary artery supplies blood to the lungs. Right ventricle is separated from the right atrium by the tricuspid valve, which prevents the backward flow of the blood into the right atrium. Pulmonary valve is between the right ventricle and the pulmonary artery. Since the thickness of the wall of the right ventricle is low when compared to that of the left ventricle, right ventricle pumps blood at a lower pressure to the pulmonary artery. The thickness of the walls of the left and the right ventricle is shown in figure 2. Right side heart failure occurs when the efficiency of blood pumping by the right atrium is low. This condition is called congestive heart failure since the blood may either back up or congest. The left and the right ventricles are separated from each other by the septum. Both left and right ventricle are the lower chambers of the heart. Both left and right ventricle are made up of heart muscles. Both left and right ventricle pump blood away from the heart. Left Ventricle: Left ventricle is the left lower chamber of the heart, which receives the oxygenated blood from the left atrium and pumps it out under high pressure through the aorta to the body. Right Ventricle: Right ventricle is the right lower chamber of the heart, which receives deoxygenated blood from the right atrium and pumps it under low pressure into the lungs via the pulmonary artery. Left Ventricle: Left ventricle develops more pressure to pump blood to the aorta. Right Ventricle: Right ventricles develops a lower pressure than the left ventricle. Left Ventricle: Left ventricle consists of a thick wall. Right Ventricle: The wall of the right ventricle is less thick than that of the left ventricle. Left Ventricle: Left ventricle is oval in shape, and forms the apex of the heart. Right Ventricle: Right ventricle is triangular in shape, and is near the apex of the heart. Left Ventricle: Left ventricle receives blood from the left atrium. Right Ventricle: Right ventricle receives blood from the right atrium. Left Ventricle: Left ventricle pumps blood into the aorta. Right Ventricle: Right ventricle pumps blood into the pulmonary artery. Left Ventricle: Left ventricle carries oxygenated blood. Right Ventricle: Right ventricle carries deoxygenated blood. Left Ventricle: Left ventricle belongs to the systemic circulation. Right Ventricle: Right ventricle belongs to the pulmonary circulation. Left Ventricle: Left ventricular hypertrophy, myocardial infarction, valve disease, and myocarditis are the diseases that can affect the left ventricle. Right Ventricle: Congestive heart failure, Arrhythmogenic right ventricular dysplasia, and double outlet right ventricle are the diseases that can affect the right ventricle. Left and right ventricle are the two lower chambers of the heart that collectively make the apex of the heart. Left ventricle pumps blood into the aorta while right ventricle pumps blood into the pulmonary artery. Since the thickness of the wall of the left ventricle is higher than that of the right ventricle, the left ventricle pumps blood with high pressure. The main difference between left and right ventricle is the pressure of the blood pumped by each ventricle of the heart. “Left Ventricle Function, Definition & Anatomy | Body Maps.” Healthline, Healthline Media, 24 Mar. 2015, Available here. “Right Ventricle Function, Definition & Anatomy | Body Maps.” Healthline, Healthline Media, 20 Mar. 2015, Available here.